Pakistan spent much of the nearly USD 1 billion received in 2017 in US foreign aid on military, former US envoy to UN Nikki Haley wrote in an op-ed. Washington/New York: Pakistan has a long history of harbouring terrorists and America should not give Islamabad even a dollar until it corrects its behaviour, Indian-American former US envoy to the UN Nikki Haley has said as she praised the Trump administration for wisely restricting financial assistance to the country. Haley, who has founded a new policy group ‘Stand America Now’ that will focus on how to keep the US safe, strong, and prosperous, wrote in an op-ed that when the US provides aid to nations, “it is more than fair to ask what the U.S. gets in return for our generosity” but instead Pakistan routinely opposed the US position at the UN on several issues. “In 2017, Pakistan received nearly USD 1 billion in US foreign aid, the sixth most of any country. Much of the aid went to the Pakistani military. Some went for road, highway, and energy projects to assist the Pakistani people,” Haley wrote in the op-ed ‘Foreign Aid Should Only Go To Friends’. “On all key votes at the UN, Pakistan opposed the American position 76 per cent of the time. Much more troubling, Pakistan also has a long history of harbouring terrorists who have killed US troops in Afghanistan,” she said. 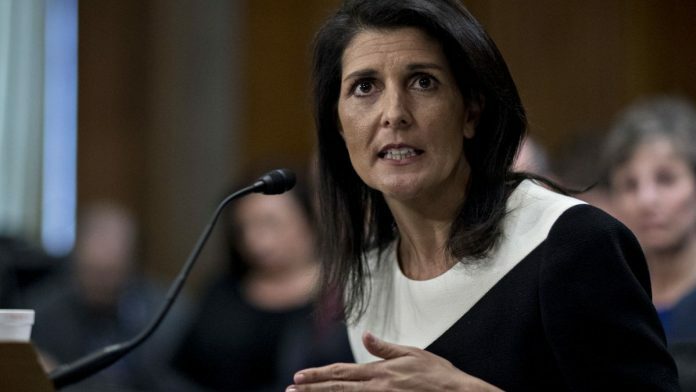 Haley, who had stepped down as the US envoy to the UN at the end of last year, has previously strongly criticised Pakistan for continuing to harbour terrorists that turn around and kill American soldiers while taking billions of dollars in foreign aid from the US. In an interview to US magazine ‘The Atlantic’ in December, Haley had said the US did not need to give money to countries that wish harm to America, go behind its back and try and “stop us from doing things”. “The one example I’ll give you is, look at Pakistan. Giving them over a billion dollars, and they continue to harbour terrorists that turn around and kill our soldiers that’s never okay. We shouldn’t even give them a dollar until they correct it. Use the billion dollars. That’s not a small amount of change,” she had said. Last September, the Trump administration cancelled USD 300 million in military aid to Islamabad for not doing enough against terror groups active on its soil. Trump had defended his administration’s decision to stop hundreds of millions of dollars in military aid to Pakistan, saying Islamabad does not do “a damn thing” for the US and its government helped late al-Qaeda leader Osama bin Laden hide near its garrison city of Rawalpindi. Haley’s new policy group aims to promote public policies that strengthen America’s economy, culture, and national security.